ANDALUCIA is famously the last refuge of the endangered Iberian lynx. 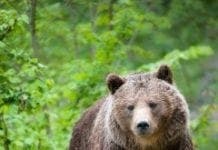 It may be hard to believe, but brown bears still roam the remote forests of northern Spain while Iberian wolves dwell in the mountains a mere 60km from the capital of Madrid. Only last month, a video appearing to show a large feline prowling in scrubland close to Estepona was posted on social media. Believed to be a puma, also known as a cougar or mountain lion, these big cats can reach a top weight of 35 kg – five times the size of the average well-fed house cat. 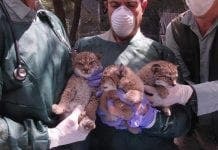 The Guardia Civil’s Seprona animal protection unit thinks it may be a pet that escaped or was released from a private residence, as local wildlife parks do not house these big cats. The report comes after years of sightings of the legendary La Cala cougar, first spotted in 2007. Police combed the area for the cult cat after a farmer reported over a dozen of his pigs had been mysteriously slain. 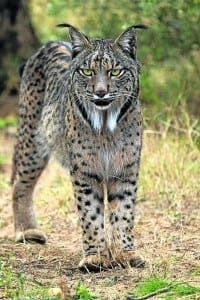 In September 2014, the Olive Press revealed that this stealthy hunter may have resurfaced after cat-lover Marion Lancaster, 71, spotted a feline ‘the size of a puma’ while on holiday in the region. So if you go down to the woods today, watch out. Although you’re unlikely to encounter packs of killer pumas on your country walks, bumping into a wild boar or a brown bear could still be a grizzly experience. If you’ve ever tried a juicy jabali steak, you’ll know these wild porkers are delicious to eat. You may even have spotted one snuffling through the undergrowth in Alcornocales Natural Park, Cadiz. The Mediterranean boar (Andalucia) and Central European boar (northern Spain) are among 16 subspecies, and while not the biggest piggies in the pack, the muscular tusked males are renowned for their pugilism. Breeding females will also fight to protect the family when cornered. Covered in coarse bristles, with a large head and muscular shoulders for digging, the omnivore boar eats everything from nuts and roots to worms, rodents and snakes. The fierce adult males have a piercing combat call and a mane which stands on end when agitated. They are rarely attacked, even by wolves. 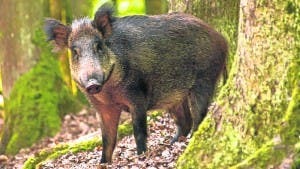 A grand old boar may live to see 25 and weigh over 100 kilos so watch your step in the forest. These super-pigs can run at 40 km per hour and jump to a height of four feet. 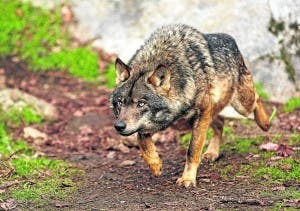 After an absence of 70 years, the wolf is making a comeback in Spain, as livestock farmers can testify. Exterminated and hunted down to a handful of packs during the 1960s, there are now thought to be more than 250 breeding groups and 2,000 individuals in central Spain. The rugged Sierra de Guadarrama is ideal wolf territory. Extending from Avila across the planes of Madrid to Segovia, attacks on livestock there have risen from 1,500 annually to over 2,000, with the loss of 13,000 sheep, 200 goats and several hundred cows in the last seven years. Wolves also eat rabbits, deer, ibex, wild boar and even fish. An alpha male may weigh 50 kilos, almost double the weight of an Alsatian. Wolf hunting is banned in Portugal but still allowed in some parts of Spain. 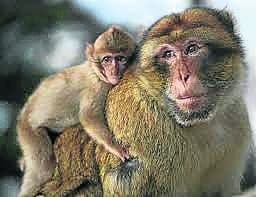 The pride of Gibraltar and one of its top tourist attractions, also found in the Atlas Mountains of Algeria and Morocco. Sir Winston Churchill was particularly fond of these tailless monkeys and legend says if they leave the Rock, Gibraltar will cease to be British. The Upper Rock Nature Reserve affords visitors the opportunity to observe the energetic antics of these semi-wild animals. Feeding them is an offence punishable by law as the macaques can become dependent on humans, which causes them to forage in the town. Direct contact is also highly discouraged although that doesn’t stop many tourists from snapping selfies with a monkey on their back. The largest predator on the Iberian Peninsula is also one of the animals most at risk of extinction in Spain, on the endangered species list since 1973. Human pressure has caused destruction of their habitat and hunting has decimated their numbers. As of 2014, the population was estimated at just 300 bears. Dwelling in the Cantabrian Mountains of northern Spain, these 180 kg heavyweights can reach two metres in height, dwarfing the tallest humans. They require vast tracts of land to satisfy their huge appetite and omnivorous diet of fruits, roots, small animals and carcasses. Characterised by their large heads, beady eyes, small, rounded ears, black paws and dark brown, blonde-tipped pelt. In the wild they can live to 25 or 30 years. They spend the hot summer hidden in the forest shade and are best spotted in cooler months. 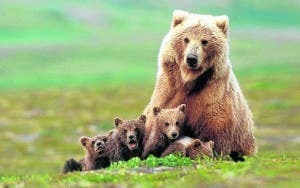 But be careful in spring when mother bears give birth to their cubs. Although timid, they are unpredictable so if one crosses your path, pretend to be a tree. This Old World vulture, also known as the Eurasian Griffon, feeds mostly from carcasses of dead animals which it finds by soaring over open areas, often in flocks. The Pyrenees population has been affected by an EC ruling that carcasses cannot be left on fields due to mad cow disease fears. 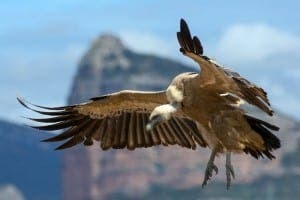 To see these scavengers at work, take the Vulture Walk, a circular trail starting and ending at Casares that takes you below the crags of Crestellina, the nesting site for a colony of Griffon vultures. A.k.a. 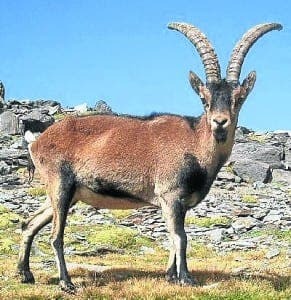 the Iberian wild goat, in 2003 it became the first extinct species to be reborn. Hunted out of existence, the last living bucardo, named Celia, died in 2000 after being hit by a falling branch. Using her DNA from frozen skin samples, scientists were able to make clone embryos by inserting the goat’s DNA into domestic goat eggs emptied of their original genetic matter. A cloned foetus was successfully implanted in the womb of a living domestic goat although it died seven minutes after birth, from lung defects. The project continues. Thanks to conservation efforts, the lynx population has recovered from under 100 in 2002 to 404, according to the World Wildlife Fund’s 2015 census. Heavily spotted for camouflage, with long legs and a short black-tipped tail, there’s no mistaking their characteristic ‘face beards’ and tufted ears. These tawny felines live in the Mediterranean forests of the Iberian peninsula and depend mostly on wild rabbits, almost wiped out themselves by myxomatosis. An adult lynx needs at least one a day, and triple that for a mother with growing kittens. Still endangered, although no longer on the ‘critical’ list, most unnatural lynx deaths are the result of being hit by cars. Their diminishing habitat is now restricted to pockets around the Sierra Morena in Huelva, the Sierra de Andujar in Jaen and Donana National Park. March to May is the best time for lynx spotting but if you sight more than the spore of this timid creature you can count yourself lucky. Previous articleFrom Nerja to Manilva: How far has construction of the record-breaking La Senda Litoral walkway progressed? 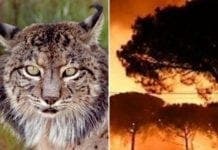 Which animals are most at risk of extinction in Spain?